Place the fish on a greased baking tray. Mix the butter, garlic and parsley together and spread a little onto the fish. Place a lemon slice on each piece. Beat the egg with 15ml of water. Put the crumbs in a shallow dish. Dip the courgettes into the egg then into the crumbs, turning to coat them well. Spread out on a baking tray that has been lined with baking paper. 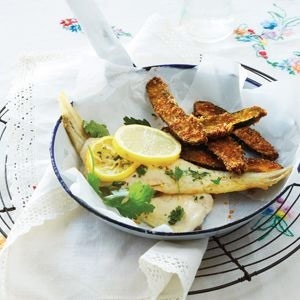 Bake the fish and the courgettes together in a preheated oven for about 20 minutes, until cooked. Turn the courgettes once during the cooking time. Top the fish with a little butter as soon as it comes out of the oven.